Are you confused about Uniforms? Which shirt do I wear when? Listen in band rehearsal and check the TROJAN BAND BLAST and we will tell you. What are the different shirt types and when are they worn? Blue Polos and Show Shirts are included in fair share for first year band students. It’s the same polo we’ve had for at least 5 years. If you lose or grow out of your polo shirt, you need to purchase a new one. Blue Polos are worn for performances, NOT for rehearsals. Also, blue polos are worn with the casual uniform. Show shirts (Black tees with “Trilogy” on the back) will be worn with shorts for some events. Show shirts are also worn with the formal uniform, under the bib pants and formal jacket (so that after performances, jackets can be taken off). Section shirts will be given out to band students. You don’t need to purchase one; every student in the marching band and dance guard gets a section shirt. It is worn for some rehearsals as requested, and sometimes worn in place of the show shirt. What if I am missing some part of my uniform? What if my uniform needs repairing? Please contact the uniform chairs ASAP so that it can fixed or replaced. Please be prepared to pay for missing parts. Also, please read the Uniform Care and Costs pages for additional information. How can I help? You can shop for extra uniform items. See our list of needed uniform items. During the year, we REALLY need parent help on uniform fitting days, and also prior to games and contests. We can use your help making sure everyone is uniformed properly. Occasionally, we need help with fittings, repairs and minor alterations. Graduating? Do you have outgrown items? Other band members can use your band shorts and shiny black uniform shoes. We can use brown belts and polos too. Please clean them and leave them in the labeled box by the uniform room, and they’ll be given a new home! Thank you. What is the CASUAL UNIFORM & why do we need one? 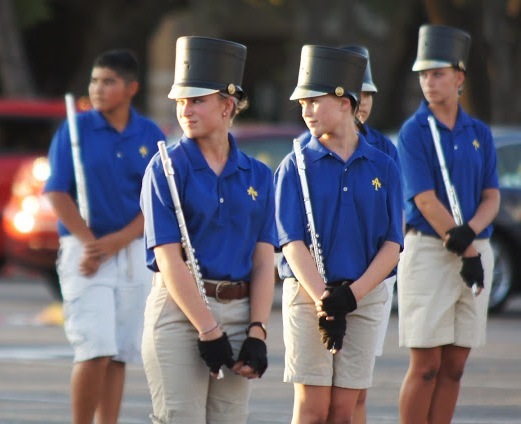 Since it is quite hot when we begin the marching season, instrumentalists wear an AT polo shirt and khaki shorts for performances, roughly until the end of September. The polo shirt is often worn for other events, such as pep rallies and parades with shorts or jeans throughout the year. Parents are offered the chance to buy one for themselves on the forms in the Summer Packet. 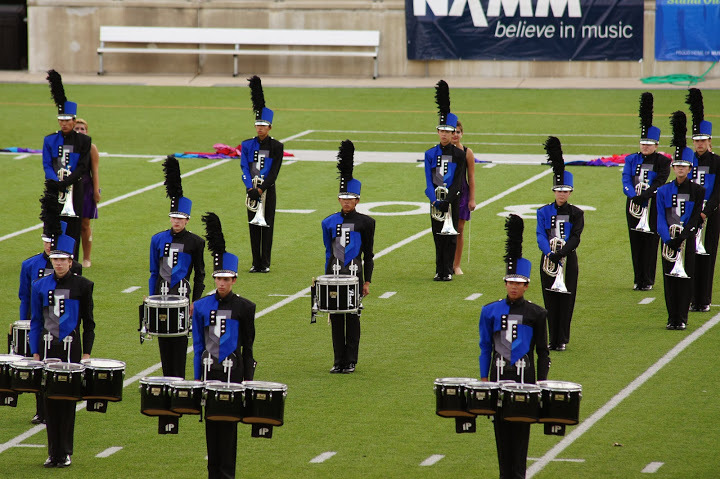 NOTE: The Casual Uniform is NOT used for summer band camp, but rather for performances in August and September. For summer band camp, students should wear their Practice Uniform: any white t-shirt of their choice (Plain white tees are preferred; small writings/logos are fine, or student can turn their shirts inside out) and any shorts (lightweight athletic shorts are recommended) and any athletic shoes. The band also has a Show Shirt, which is worn to designated rehearsals and performances as well as under the bib pants when the formal marching band uniform is worn. The Trojan Band Blast will generally announce which shirt is to be worn for certain functions. Band Shorts: Bermuda style shorts. NO CARGO PANTS or pockets on the side. See below for where we have found the shorts this year. The color is tricky; it is not khaki and usually not tan. The manufacturers change the name almost every year. Email the Uniform Committee for loaners to shop with if you need to match colors. The Dance Guard section has a different summer uniform, please refer to the Guard Uniform section below or contact the Dance Guard for more information. The shorts for the Summer Uniform are Bermuda or “Khaki-style” shorts. NO CARGO POCKETS! They should have an inseam (the seam on the inside of the leg) that is a minimum of 7″, and preferably no longer than 9″. NO SHORTER THAN 7″! The color is the tricky part: not standard khaki, not tan, not gray, not white. See the links below for examples that should be correct, unless the color shown on the computer does not match the in-person color. You can shop anywhere you like, but please review the links below before shopping. If you have a question about a particular option, please e-mail me at Doedi@batcity.net. Formal uniform: jacket, bib pants, hat/ hat box, black socks, gloves, wrist bands, and black marching shoes. You are responsible for your entire uniform. You will be put on the school obligation list for any lost items until the item is recovered or paid for by you. When you are allowed to remove your jacket at the event/game or on the bus, fold it with the shield on the inside to help keep it clean. Bib Pants: The zipper goes in the front! Bibbers should touch the top of the shoes without a “break” in the pant. The stirrups are worn inside of your shoes! Jackets: The zipper goes in the back! You must hook the neck closed. Hat: Fit with the chin strap buckled. The brim should sit at the eye brow and not be tilted back. The hat should not “wiggle” too much. If necessary, adjust the laces inside the hat or the chin strap or add foam strips for a better fit. The Uniform Room staff has foam strips and can help you. Check this at inspection and make the necessary adjustments then. Do not wait until you are warming up to perform! Show Shirts: They are worn under your bibbers and jacket. Shoes and hats should be wiped with a damp cloth as needed. Cleaning supplies will be available in the Uniform Room prior to games and events. Hat Plumes: Plumes will be passed out and fitted at the event/game. After the performance, return plumes as instructed. You do not keep the plumes! Socks: Students provide calf-length black socks. Hair (boys and girls! ): Hair must be out of your eyes and must not touch the collar of your jacket. It must be pulled up into ponytail or concealed with headband under your hat. Judges actually look for these details. Haircuts are the best option! On contest days hair must be pulled up, bobby pinned, and hair sprayed before inspection. The Uniform Room staff has hair spray, headbands, ties, and hairpins for those who need them. Save and reuse the bobby pins, ties, and headbands given to you. Put them in your hatbox! If you have been given a black headband, keep it in your mesh bag and use it at each event. Headbands must be turned in with your uniform in the spring. Nails: NO nail polish. Nails should be clean. Jewelry: NO jewelry (Only VERY SMALL stud earrings are acceptable. )SECTION LEADERS need to look carefully during inspections, especially on competition days. Please make what adjustments you can within your section. The Uniform Room staff will be available to help with those things you cannot correct. Get used to volunteers working with your hair, adjusting the stirrups, checking shoes, and checking jacket hooks, etc. The Uniform Volunteers are there to help you, so please cooperate. Thank you. DO NOT FORGET TO BRING YOUR UNIFORM, MARCHING SHOES, AND YOUR HATS TO SCHOOL! ALSO, DO NOT FORGET YOUR SHORTS, SOCKS AND SHOW SHIRTS! BE SURE YOU BRING YOUR BLUE WATER JUG TO EVERY EVENT! NON- MESSY SNACKS AND CLEAR LIQUIDS ARE ALLOWED. If you have any uniform problems, please let the Uniform Room staff know immediately so that adjustments can be made before the next event. We will be in the Uniform Room early on event days to work on uniforms, so please leave your garment bag and uniform hanging in the Uniform Room. Pin a note to your uniform bag telling us what the problem is so that it can be fixed. IF IT IS A BIG PROBLEM, EMAIL THE UNIFORM COMMITTEE REP IN ADVANCE! PLEASE DO NOT WAIT UNTIL THE LAST MINUTE. Thank you. YOU WILL BE CHARGED if your uniform parts are ruined due to incorrect care. FOLLOW the Uniform Care instructions to avoid charges. See replacement costs for pricing information.